New Haven Friends Meeting is interested in sponsoring young adults under age 30 to learn first hand about the legislative process and who are also passionate about climate disruption. This program is offered through the Friends Committee on National Legislation. Join hundreds of young adults from across the country to lobby Congress to act on climate change. Congressional action is essential to catalyzing the urgently-needed national and global solutions to climate change. But Congress is letting bipartisan politics stand in the way of progress—disagreement about whether climate change is human-caused is threatening our future. Strategists believe that the faith community is in a unique position to end this debate and illuminate the way forward by establishing the moral foundation surrounding the climate change movement. About The Friends Committee on National Legislation: The Friends Committee on National Legislation (FCNL) is a Quaker lobby in the public interest. FCNL believes that citizen involvement in the political process is critical for our country’s future, and we’re dedicated to providing tools, resources, and training to help people of all ages participate in that process. The 41st Annual People’s World African American History Month Celebration on Sunday, February 22, will feature a youth march followed by a program highlighting guest speaker Zenobia Thompson, long time social justice activist in St. Louis, Missouri. The youth organization New Elm City Dream is organizing the march around the theme “Hands Up, Hoodies Up – Jobs for Youth, Jobs for All.” Time and place will be announced soon. Following the march the annual program will be held at 4 p.m. at the New Haven Peoples Center, 37 Howe Street. Its theme is “Indict the System – Life Matters for All – Let Us Breathe and Grow.” Guest speaker Zenobia Thompson, a retired nurse, serves as a board member of Missourians for Alternatives to the Death Penalty and participates with Jobs with Justice, Coalition of Black Trade Unionists and the Organization for Black Struggle. She will address the situation of police violence in Ferguson, near where she lives, and issues of overcoming structural and institutional racism. The program will begin with drumming by Brian Jarawa Gray. Winners of the High School Arts and Writing Competition will present their essays, poems or artwork on the theme “How Do We Achieve Justice for All?” In the context of the 50th anniversary of the Voting Rights Act the students are asked to create their work on the following question: “Your vote is your voice. If your voice were heard what ideas would you present to local, state and federal governments toward a bill of rights for fair and equal policing? What actions could you take to achieve justice for all?” Deadline for entries is February 12. Drawings from the Martin Luther King celebration at Peabody Museum will be on exhibit, drawn at the People’s World exhibit on the theme, “With My Vote I would Love to See…” Highlighting the Voting Rights Act, a mock voting booth was available and children cast their ballots for the best way to honor Dr. King. Contributions will be accepted for the 2015 People’s World fund drive in Connecticut. For more information call (203) 624-8664 or e-mail ct-pww@pobox.com. 1) We are breathing a sigh of relief. Vermont Yankee nuclear plant has been a dangerous neighbor for too long. The lights will not go out. The closing will not affect regional grid stability. 2) A cozy and uniquely informative PACE meeting will be held at 7:30 p.m. on Wednesday, February 11 at the very special home of Nevin and Julie Christensen on 44 West Mountain Rd. in West Simsbury. Good food included! Note: snow date: Thursday, February 12. Please come to discuss and act on many of the following subjects: solar expansion in Connecticut, shared solar, hemp agriculture (hemp pellets), solar awards, legislative priorities, cyber security, the status of Millstone nuclear plant and Vermont Yankee, the Pure House, the utility rate structure, and the exciting spring solar tour! If possible, please bring tasty treats to share and your favorite solar device. See the new iPhone solar cell charger and the amazing Luci inflatable solar lantern… plus meet some really nice people! 3) Listen to this important broadcast about Fukushima if you can: http://www.nuclearhotseat.com/category/uss-ronald-reagan NUCLEAR HOTSEAT is a fascinating weekly radio program on nuclear energy and nuclear weapons. This interview is with Dr. Alex Rosen of the International Physicians for the Prevention of Nuclear War blasting the UN Report on Fukushima. The second interview with Joseph Mangano is about the US sailors who came to try to help Fukushima victims and were exposed to radiation. Help Decide Connecticut’s Energy Future! The Connecticut Department of Energy and Environmental Protection (DEEP) is making long-term plans for our state’s energy future and we have until Feb. 11 to weigh in. DEEP’s plan, known as an Integrated Resource Plan (IRP), includes some good things, like an increase in energy efficiency, but also some bad things, including a continued reliance on coal-fired power from the Bridgeport coal plant. These plans are for the next ten years, so it’s important that we make our voices heard for solar, wind and efficiency today! Submit an official comment to DEEP to make plans for retiring coal and replacing it with solar, wind and efficiency in Connecticut’s long-term energy plans. The Bridgeport plant was rated the 8th worst environmental justice offender out of 431 coal plants across the country and needs to be replaced with clean energy to protect our health and the environment. Connecticut has the skilled workforce and resources we need to move beyond coal to clean energy, but we need a plan to get there. Help move Connecticut beyond coal to a clean energy future! Let DEEP Commissioner Rob Klee know that you support better energy efficiency, increased use of solar and wind, and the retirement of the Bridgeport coal plant. DEEP is taking comments on the draft 2014 IRP until February 11. Submit comments at DEEP.EnergyBureau@ct.gov, or via the Department’s Energy Web Filings system. The 64 Days officially begins each year on January 30, the day Mahatma Gandhi was assassinated, and ends on April 4, the day we commemorate Dr. King. In our annual observation of the 64 Days at SCSU, we continue to celebrate the peace and justice heritage in many of our cultures and heritages, including our observation of Black History Month, Women’s History Month, and Asian/Pacific Heritage Month. “An Act Providing a Medical Option of Compassionate Aid in Dying for Terminally Ill Adults,” Proposed Bill No. 668, has been referred to the Judiciary Committee for the spring 2015 Connecticut state legislative session. It is being sponsored and promoted by some of our most progressive state legislators, including Gary Holder Winfield, Roland Lemar and Toni Walker. It is imperative that we as their constituents and supporters on many other initiatives contact them immediately to demand that they withdraw their support for this legislation and work to defeat it. Last month, Elaine Kolb clearly explained why the disability rights community is so opposed to this legislation. She described her painful fight for the necessary treatment and services to sustain her partner’s life as long as possible: “Patti Deak lived and died with dignity, with multiple disabilities, using a power wheelchair, hospital bed, Hoyer lift, hearing aids, and a ventilator… With cut-backs in so many essential services, the message behind assisted suicide is that death is cost-effective. For those of us in danger of being denied what we need to live, ‘Compassion and Choice’ feels more like ‘Contempt and Coercion’” (emphasis added). I experienced such contempt and coercion while fighting for treatment for my elderly mother, Catherine (1922-2012), who suffered from vascular dementia and a severe heart condition. As her health care advocate, I was continually and repeatedly harassed, bullied and threatened by various health care professionals at Yale-New Haven Hospital to “let her die.” As a Medicare/Medicaid patient, she was costing them too much and her life was not valued. You can read the details of this experience at http://www.nhregister.com/opinion/20140304/forum-aid-in-dying-bill-neither-compassionate-nor-wise. All this occurred in a state where medically assisted suicide is not yet legal. Whatever its language, such a bill cannot be tweaked or improved to be made safe or unthreatening to those of us who are physically, mentally and/or emotionally vulnerable. The potential for coercion and abuse, both by a health care system increasingly concerned with profit and, in some cases, by family and friends who are tired of the “burden” of care, is simply too great. 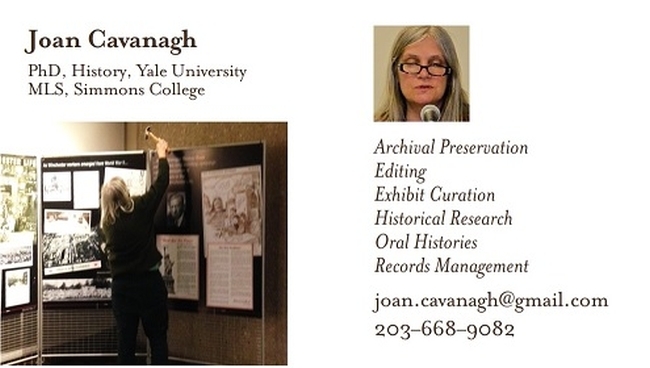 Joan Cavanagh is a member of Second Thoughts Connecticut and a long time peace and justice activist. New Haven activists joined thousands of others across the country to mourn Leelah Alcorn on January 10. In the wake of the transgender 17-year-old’s suicide, activists have mobilized across the country to stand for trans rights and an end to so-called ‘conversion therapy.’ While trans suicides are not uncommon, the visibility of Leelah’s was widespread, including a suicide note widely reposted. New Haven has become a hotbed of trans activism, with the Justice for Jane campaign bringing together activists from all over Southern Connecticut. Jane is a 17-year-old trans girl being held in DCF custody at a men’s facility in Middletown. Just like Leelah was, she is being denied the right to express her gender. Attendees at the vigil and rally made promises to Leelah to help fix society. One of the most poignant came from IV, a Justice for Jane organizer. The Young Men’s Institute Library is proud to host the Listen Here Short Story reading series. Join us for a night of classic short stories selected by the staff of the New Haven Review and read by cast members of the New Haven Theater Company. Reading starts at 7 p.m., with a talk back at 8 p.m. that explores the background, meaning, and dramatic interpretation of that night’s stories. Also, freshly baked cookies–a different batch at each reading–and tea are available. $5 suggested admission, but no obligations! Next reading’s theme: “Where Ya Going?” Our stories include “The Swimmer” by John Cheever and “Along the Scenic Route” by Harlan Ellison. Join us Thursday, February 12, 7 p.m. at Young Men’s Institute Library, 847 Chapel St., New Haven. Save these others dates as well for future readings, same place, same time, different stories, different actors reading: March 11, April 9, and May 13. (Please note that the Institute Library is one flight up and, most unfortunately, not wheelchair accessible.) For more information, visit us at www.institutelibrary.org. The CT Roundtable on Climate and Jobs is launching their public campaign to pass legislation capping the monthly fixed charges for residential and small business electricity customers. There is a new Facebook page and website to share information and build a broad-based coalition. Like them on Facebook! Use your social media networks to share information about the campaign with groups all across the state. We posted this meme to the Facebook page as our first public outreach, and our following is already starting to grow. CTEnergyRelief.org is the new webpage that will serve as a source of more detailed information about the campaign and legislation. It already provides good educational materials to help you understand the details about fixed charges. Use #CTEnergyRelief as the hashtag when sharing info about the campaign via Twitter. Like us on Facebook to get all our updates and action alerts. We anticipate a public hearing in the Energy and Technology Committee in the coming weeks, and there will be many opportunities to contact your legislators at key points during the session. Donate online via IREJN (our fiscal sponsor); include “Roundtable” in the comment box. 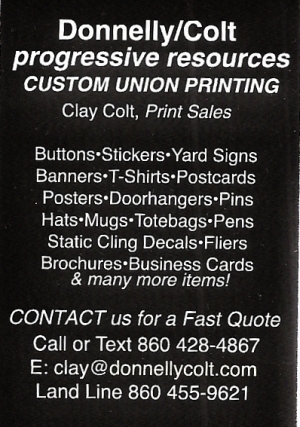 Or mail a check, payable to IREJN, with Roundtable on thememo line to PO Box 270147, West Hartford, CT 06127. The CT Roundtable on Climate and Jobs is a partnership between the Interreligious Eco-Justice Network and the AFL-CIO that seeks to strengthen collaboration among Connecticut’s labor, environmental, and religious groups in advocating for public policies that address urgent concerns about climate change while creating good-paying jobs right here in our state. On Friday, January 23, Kathy Kelly, co-coordinator of Voices for Creative Nonviolence, a campaign to end U.S. military and economic warfare, began her three-month jail sentence in federal prison for a protest against drones at Whiteman Air Force Base in Missouri. The arrest followed an attempt by herself and Georgia Walker to deliver a loaf of bread and a letter to the commander of Whiteman Air Force base, asking him to stop his troops from piloting lethal drone flights over Afghanistan from within the base. From 1996-2003, Voices activists formed 70 delegations that openly defied economic sanctions by bringing medicines to children and families in Iraq. Kathy and her companions lived in Baghdad throughout the 2003 “Shock and Awe” bombing. They have also lived alongside people during warfare in Gaza, Lebanon, Bosnia and Nicaragua. This will be her fourth time in a federal prison. Kelly has been involved in numerous nonviolent campaigns to end war, some of which have involved lengthy imprisonment. If you would like to reach out to Kathy in the next 3 months I’m sure she would welcome the contact. If you feel inclined to send something, she loves novels, especially novels written by people from other countries. The Western Massachusetts Jobs with Justice Educational, Organizing, & Membership Conference will be held Saturday, Feb. 28, 10 a.m. to 4:15 p.m. (includes lunch) at Trinity United Methodist Church, 361 Sumner Ave., Springfield MA. There is no cost to attend this conference. It is fully underwritten by the grants and donations of generous supporters. You may make a donation at registration or at the conference. Keynote Speaker: Sarita Gupta, Executive Director, Jobs with Justice. Sarita is a nationally recognized expert on the economic and political issues affecting working people across all industries, particularly low-wage workers. She is widely recognized as a key leader and strategist in the progressive movement. Tabling Opportunity for Progressive Organizations: Sliding scale donation requested: $10 to $50. Set up 8-9 a.m. Send request to wmjwj@wmjwj.org. Workshop details are in development.